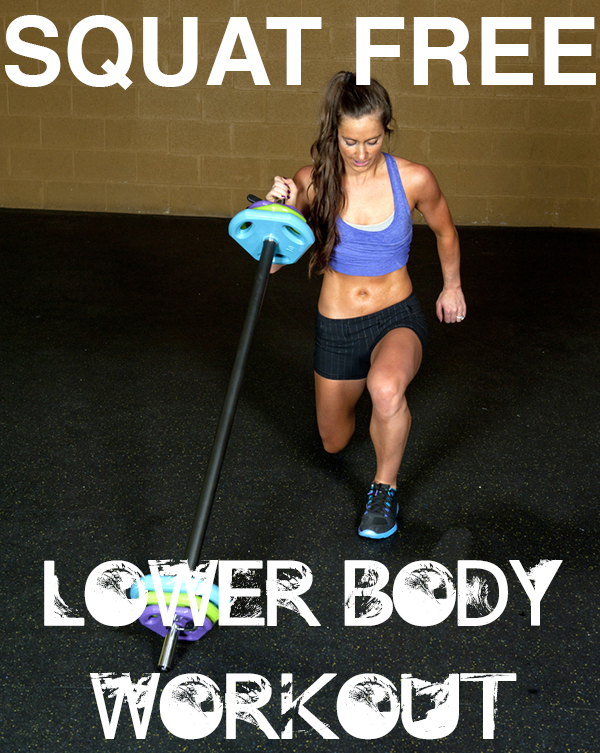 If squats are painful or have been forbidden by your doctor, there are still many exercise options for your lower body. Try this workout combination for an effective leg workout sans squats. Do 2-3 sets of each exercise, 10 – 12 repetitions per set. Step-ups: A step up can be done with an aerobic step, a weight bench or a stair in your home. I prefer a weighted version (holding a dumbbell in each hand), but you can do it with just your own body weight, especially if you use a higher step like a weight bench. Make sure to keep your weight in the heal of the foot leading, not the toe, during this movement. For variety, you can also move laterally (facing parallel of the step and stepping up to the side) or add upper body movements like shoulder presses. Standing Hip Flexion: This exercise comes close to the quad strengthening seated leg extension I mentioned earlier. However, in a standing position with a resistance band you engage more stabilizer muscles in your legs and core. Secure a resistance band to a sturdy and low anchor, like a couch. Attach the other end of the band to your right ankle or foot. Stand up straight, holding onto the wall or back of a chair. Bend your right leg to 90 degrees and lift your right knee to hip height, hold for a one second pause and the return to start. Hip Thigh Extension: This version of a single leg bridge is not only a great shaper for your glutes, it also works the muscles in the front of the leg. Lie down on the ground, face up, with the left knee bent and left foot flat on the ground. The right leg will be extended straight with the heal slightly off the ground. Lift your hips and lower back off the ground while keeping the right leg extended straight. Hold for a one second pause and then return to the starting position, keeping the right leg engaged and slightly off the ground until the last repetition. Switch side and repeat the same number of repetitions with the left leg extended. Reverse Lunges: Taking your lunge in reverse can take some pressure off the knees. I often have clients who can’t do squats or forward lunges but who feel no pain going in reverse. These can be done with just your own body weight or a dumbbell in each hand. No matter the direction, always pay attention to proper form. Toes and knees should be pointed forward and the front knee should stay over the ankle with a vertical shin. There is no need to bring the back knee all the way to the ground, just aim for a 90-degree angle in both knees. For an extra core challenge hold a dumbbell in only one hand while lunging with the opposite leg. Kettlebell Swings: Kettlebell Swings are a hinging movement, not a squatting one. They are great for the posterior chain and can help you get your cardio, too! Boost the cardio effect by doing extra sets of swings (up to 10) at the end of the workout with minimal rest in between. Muscle burn is OK when you workout. Muscle fatigue is part of the process. Otherwise, pain is not part of the program. If squats cause you pain, you can (and should) stop. These moves will help keep you functional and fit without machines or extra ibuprofen!